Winning a big award in the Sundance Film Festival is not the norm for an adaptive physical education teacher, but it’s just what Darlene Anderson ’73 did earlier this year. Anderson, who works with mentally disabled adults in the Philadelphia area, served as a unit production manager for the award-winning documentary, “Dina.” The movie tells the candid, real-life love story of Dina Buno and Scott Levin, two suburban Philadelphians on the autism spectrum. The movie won the Grand Jury Prize for U.S. documentaries at the Sundance Film Festival in January 2017. 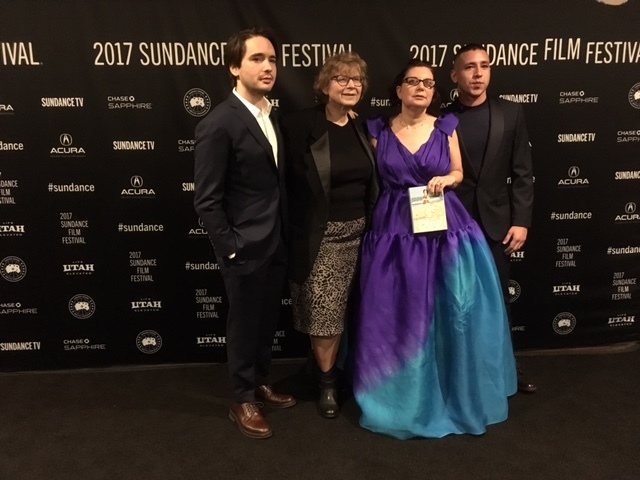 Darlene Anderson ’73 (second from left) poses for a photo at the Sundance Film Festival with (from left) Dan Sickles, Dina Buno, and Antonio Santini. The movie was directed by Dan Sickles and Antonio Santini. Anderson has known Sickles for decades, having worked with his late-father, Ed, who was co-advisor of the Kiwanis Aktion Club, a service club for disabled adults. She also knew Buno and Levin, who are members of the club. “Dina” opens in select theaters in October, including several locations in the Philadelphia area. An invitation-only, red-carpet premier will be held at Philadelphia’s Kimmel Center on Monday, October 9. It also will show at the Ambler Theater, in Ambler, Pennsylvania, on Thursday, October 12, and the Ritz at the Bourse 5, in Philadelphia, on Oct. 13 and 14. Additional release dates and theaters and the movie trailer can be found at dina.film.